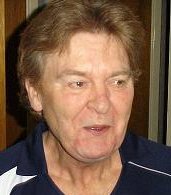 Tony Read, who was Billy Fury's career and road manager in 1981-3, as well as being a great personal friend, died in Dorset County Hospital on June 1 2010, aged 66. Tony ran Billy's fan club in the early 70s, and was the guiding force behind the Missing Years and Magnum Force LPs. After Tony and Hal Carter financed the recording of the backing for Be Mine Tonight in 1982, Tony persuaded Billy to lay down the vocal. In my opinion, and that of many other people, that created one of the most dynamic, but sadly overlooked recordings of Billy's entire career. Billy recalled: "A great friend of mine, Tony Read, telephoned me - well, he´d been phoning me for years - and said could I come and make another recording. I kept saying no, till eventually he actually cut the track together with all the musicians. So I couldn´t turn him down. Spent five or four grand on this track. So I kind of had to do it." During Billy's appearances in 1982, Tony was virtually ever-present off-stage, personally introducing Billy to many fans. Tony was born in Cornwall and joined the Army at an early age. He married twice and had two boys from his first marriage, and three sons and a daughter from the second. On leaving the army, he ran a small taxi firm, A-Line, in Weymouth, then set up a flower shop, which was followed by a second-hand shop, in which there was a small alcove dedicated to Billy Fury. When he toured with Billy, he often stayed at Billy's farm in Wales (now owned by Jenny Warwick). On one occasion Billy was at the farm on his own and when he collapsed the first person Billy rang was Tony. Tony immediately rushed from Weymouth to Wales (200 miles) to be at Billy's side. Tony's funeral was attended by about 15 people, including Vic England, Rob and Chris Dee and Pat Young. Telephone interview by Matthew Shepherd of BBC Radio Cornwall, 2009. Many thanks to Vic England and Chris Eley for information. Pictures courtesy of Vic England.